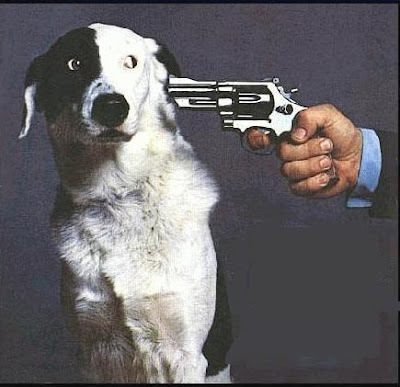 Stale Gum: If you don't trade me Panini World Cup stickers, I'll shoot this dog. alright dude... my list is up. I have as many dupes as I have stickers in my book. After 50 packs. What the heck are the Coca-Cola stickers? I don't want to know what that promo sticker is. hey man, I just got a box (50 packs) that I will be cracking. I should have some doubles for you as well as some needs. I am already 25 packs in outside the box, so I should be close to done by the end of the box. Send me an email and we'll do some sticker trades! I haven't even found a place to buy these things in my backwoods part of the world... Pull the trigger. I'm not really an animal person anyway.